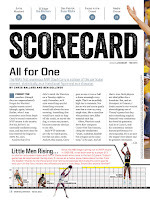 Aart Dekker nam op zijn 18e een abonnement op het illustere Amerikaanse Sport-magazine Sports Illustrated. Het duurde een week of zes voor het magazine de reis over de oceaan voltooide, maar dan verslond hij het van de eerste tot de laatste bladzijde, totdat zijn eigen basketball-activiteiten zoveel tijd vergden dat dat er niet meer inzat. Sindsdien koopt hij met enige regelmaat papieren issues bij de American Bookstore (Den Haag of Amsterdam). 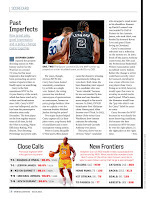 Alles wat Sports Illustrated ooit publiceerde is op het Internet terug te vinden op 'SI.com/Vault'. Om extra aandacht te richten op dit fantastische medium richt Dekker regelmatig via zijn Blog de focus op een oud artikel dat nog steeds meer dan lezenswaardig is, onder het mom van ' SHA-ART'IE '(of wel Shared by Aart). 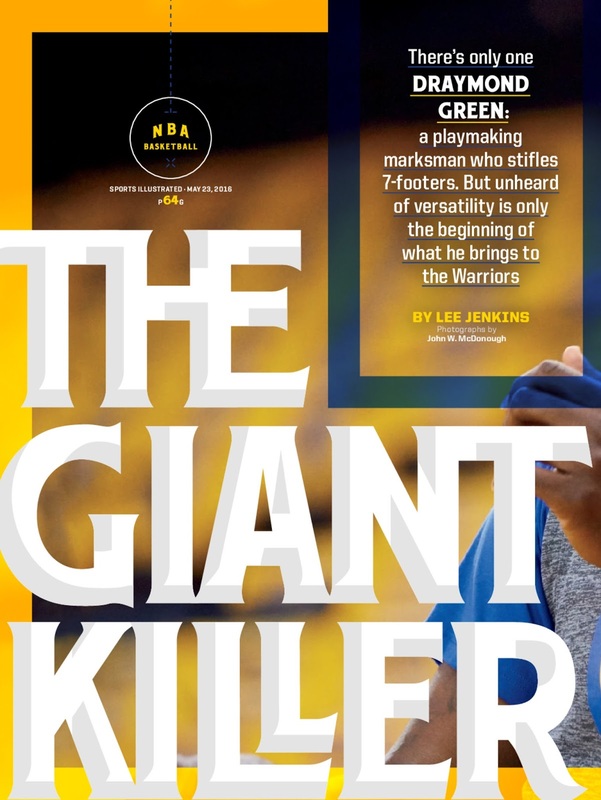 Deze eerste keer Draymond Green, 'The Giant Killer', een coverstory van 17 mei 2016. Het NBA-seizoen 2017-2018 is nog maar net begonnen, of we zagen alweer dezelfde beelden die we de laatste jaren zo vaak konden zien; de super intens spelende alleskunner van de Golden State Warriors, die zich zo mee laat slepen door zijn emoties, dat hij tot op -of over de rand- gaat in zijn bejegening van de scheidsrechters. Wat ZiggoSport-commentator Ronald van Dam dan weer doet verzuchten dat "...hij vindt dat die Refs wat hem betreft wel wat stevigere maatregelen zouden mogen nemen om dit (wan-)gedrag aan te pakken..." Dit gedrag -toen wel een keertje stevig bestraft- kostte de Warriors waarschijnlijk het Kampioenschap in de NBA-Finals van 2016, maar dat lijkt uiteindelijk bij Green niet tot het inzicht te hebben geleid dat hij beter een beetje kan dimmen, of misschien alleen als er echt iets groots op het spel staat. Ook de clubleiding van Golden State ziet er blijkbaar nog steeds geen reden in om echt in te grijpen. Green is natuurlijk ook wel een essentieel onderdeel van de superploeg die de Warriors nu al voor het vierde opeenvolgende seizoen zijn. Het SI-artikel graaft diep in Green's verhaal en persoonlijkheid en is dus nog steeds een mooi kijkje in de keuken van het team dat ongetwijfeld ook dit seizoen weer de gedoodverfde kampioen is, en zeker ver zal komen in de NBA Play-Offs. Een aanrader dus! EVEN AFTER 73 WINS and 82 million dollars, after the championship and the All-Star Game, after Steph Curry called him the voice and Steve Kerr called him the heart and nobody dared call him a tweener again, Draymond Green still sometimes sprints down the court on defense and hears a giant holler to the sideline: "Coach, post up!" The giant points down at Green, a head shorter, and raises a mitt on the left block. And just like that, everything Green has done throughout the day to quiet his soul—watching the WNBA on TV in his home atop the Berkeley Hills, playing dominos with his friends, eschewing coffee for water and hype music for J. Cole and Boyz II Men—flies out the window of Oracle Arena. The giant might as well have doused Green's gold jersey in jet fuel and struck a match. "Are you f------ kidding me!" Green bellows, re-creating not one specific scene but hundreds of them. "You have to be joking right now! You cannot really be talking about me! You cannot! You think you're stronger than me? You're not. You think you're going to bully me? You're not. You think you're going to score on me? You're not." Green is suddenly transported to the Civitan Rec Center in Saginaw, Mich., once again the pudgy kid with the Ben Wallace Afro ignored by the older boys every time he chirped "Next!" He'd sit down in the middle of the court and scream, "Who do you think you are? I'm not leaving this floor for you!" Regulars alternated between sticking him in trash cans, rolling him in rugs, setting him on the rim and banishing him to the pool table. He hurled billiard balls at his tormentors. "There were grown men trying to fight me," Green says, "and I fought them all." He fought anybody who messed with him and anybody who messed with his more reserved older brother, Torrian. Every other day, it seemed, a manager named Tyrone Davis had to kick him out of Civitan. Draymond would occasionally leave with a busted nose, as well as a game ball, which he would boot over the nearest fence. "Those big boys eventually learned," says his mother, Mary Babers-Green, "that my baby better get his next." After Draymond cooled off he retreated across the street to his house, where Mary braided women's hair, one of her three jobs. "He was like my assistant," says Mary, who raised Draymond with his stepfather and her ex-husband, Raymond Green. "He always wanted to walk the ladies to their cars. He'd push his brother back and tell him, 'Let me do it!'" Day Day, as friends and family called him, yearned to be a man. When he fought his way into the pickup games at Civitan, gang members sat in the bleachers and bet hundreds on him, awed by his toughness. Green is 26 now—a 6'7", 230-pound basketball revolutionary, arguably the best defender in the NBA and the best playmaker of his size—but everywhere he looks he still sees giants trying to toss him in trash cans. "This guy really thinks he has a mismatch!" Green tells himself, isolated on the block against the springy 7-footer. "He really thinks he's going to destroy me!" Often he spews his stream-of-consciousness out loud. "Sometimes I say it to get myself going," Green says. "I don't do it to bother anybody. But if it bothers them, that's cool, too. I don't really care." Unless you're trying to back him down, he comes across as far more endearing than angry, the Warrior you'd most want to drink the proverbial beer with. His bravado is part of his brilliance, like the boxers he idolizes, from Muhammad Ali to Mike Tyson. They could talk themselves into anything. Such was the power of their voices. When the post-up ends the way it so often does, the giant clumsily fumbling a drive or clanking a hook, Green flexes and stares. "I see his head drop," Green says, "and I hear him talk to himself, 'Come on, let's go, what are you doing? This guy is so small!'" Green beams as he turns and stomps downcourt. Look who's in the trash can now. Look who got next. "I feel in that moment like I took his spirit," Green says. "And that's an amazing feeling for me." GOLDEN STATE has finished practice and most players have gone home, except Green, who stands at the middle of the court in his gray Roots sweats and relives his predraft workout on this very floor. The Warriors won the championship last season, won the most games in NBA history this season, and are back in the Western Conference finals, against the Thunder. Nobody cares anymore that Green was drafted 35th in 2012. "They had Jeff Taylor bring the ball up against me," Green howls, recalling the former Vanderbilt swingman who was taken four picks ahead of Green and is already out of the league. "I took it from him every time!" After the audition Warriors.com asked Green how he felt about the term tweener, which back then was still used to describe prospects considered too big for one position and too small for another. "I don't mind," Green replied. "It means I can do multiple things." Then he left for his next workout in Oklahoma City, confident that he wouldn't be back, that he didn't belong in a place as sunny as California. Green remembers details about the draft that his own front office does not. He believed the Hawks would take him at No. 23, before general manager Rick Sund was replaced. He assumed the Grizzlies wanted him at 25, before Robert Pera bought the franchise from Michael Heisley. At least he could be sure the Bulls would snag him at 29. "They took Marquis Teague," he sniffs. Even the Warriors tabbed Vanderbilt center Festus Ezeli at 30 before finally coming to their senses five picks later. "We were too focused—the league was too focused—on positions," Golden State GM Bob Myers says. "Who cares what position he played? He helped us learn—really, he helped everybody learn—the value of multiple positions." The Warriors, building around the backcourt of Curry and Klay Thompson, were searching for oversized playmakers. They believed Green's skill set would mesh. They weren't as sure about his personality. A few days after Green lost his first preseason game in Denver, the Dubs practiced in Portland, and the brash rookie upbraided veterans David Lee and Jeremy Tyler: "I'm going to push you, David! I'm going to push you, Jeremy! If I cuss you out, don't take it the wrong way: I'm pushing you!" His new teammates looked at him as if he were possessed. 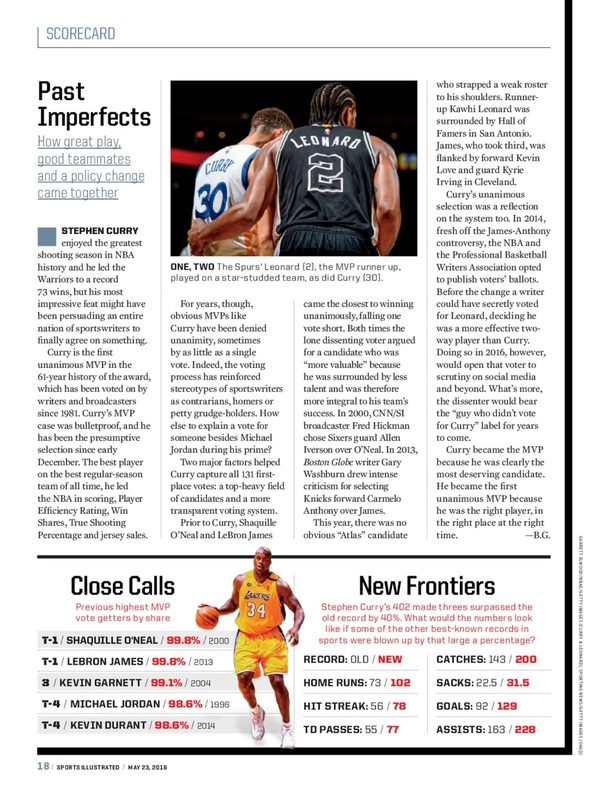 By NBA standards, the Warriors were a tranquil group, with key players who hailed from privileged backgrounds. Curry and Thompson, sons of pros, were raised in the suburbs of Charlotte and Orange County, respectively. "I felt so different," Green says. His first coach at Longstreet Elementary School in Saginaw was his uncle Bennie Babers, whose approach may have been a little different from Dell Curry's. "He'd chase us down and beat us up," Green says. "He'd hit us like we were men—not in the face, but body shots. I needed it, too. I was a crybaby. I was a sore loser. I had a bad attitude." There were days even Bennie couldn't get through to Green. "Get your hat, get your coat and hit that door," he used to say. Green starred at Saginaw High, but he was mocked mercilessly because of his pear-shaped frame, which earned him the nickname Dancing Bear at Michigan State. "People told him, 'You're too fat, you're too short, you're too slow,'" Spartans coach Tom Izzo says. "I'm the one who told him half those things." Some of the jabs were deserved. "First day in the weight room," recalls former Michigan State captain Travis Walton, "he threw up trying to lift 135 pounds." After Green languished on the bench during a win at Ohio State as a freshman, he called home from the bus in tears. "I'm leaving!" he told his mother. He was looking for sympathy from a woman who used to excoriate him so loudly during games—"Day Day, you soft! "—that his coaches felt compelled to soothe him. He couldn't go back to Saginaw. He stayed in East Lansing. "Draymond and I probably had more talks in the next four years than I had with my wife," Izzo cracks. "And later at night, too." The coach put up with Green kicking missed shots to the rafters in practice and challenging play calls in timeouts—"Some of our huddles were a freaking war zone," Izzo laughs—because the Dancing Bear was the rare player who cared as much as he did. Izzo's top assistant, Dwayne Stephens, was put in charge of defusing Day Day, staring down Green whenever he noticed the steam rising from his scalp. NBA evaluators knew Green was a spitfire. They didn't realize he was also a hardwood genius. He deconstructed Big Ten scouting reports for his teammates, and idly chewed his nails in walk-throughs because he picked up concepts much more quickly than others. Mouthy and smart, the Warriors would learn, are not mutually exclusive qualities. "You should be teaching this," Darren Erman, Golden State's former defensive architect, told Green during a film session as a rookie. Green diagnoses plays midpossession, blurting, "They ran this against us last year!" When Erman urged him to shed weight, he cleverly hauled an exercise bike into the sauna. Erman recounts a sequence, from early in Green's career, when Golden State gave up consecutive layups to a center coming off a pick-and-roll. "Next time they do that," Erman told Green, "I want you to cheat the play and block the f------ thing!" Erman didn't think Green could do it—he is 6'7", after all, and without a skyscraping vertical leap—but the coach was speaking Day Day's language. Green rose up and swatted the 7-footer, prompting bewildered looks on the Dubs' bench. "How does that kind of stuff happen?" asks Golden State assistant Bruce Fraser, nicknamed Q because of his good questions. "I'm asking because I really don't know. How does it happen?" There is no easy answer. A 7'1" wingspan helps, as does an unyielding will. "He also reads the game better than any player I've ever been around," says former Warriors assistant Brian Scalabrine, who was a teammate of Kevin Garnett's. Green could detect, in the distance, a larger movement developing across the NBA. Several teams, led by the LeBron-era Heat, were deploying smaller, swifter, more versatile lineups. Green was no stopper at Michigan State, but what if he could defend every position, while rebounding like a center and passing like a guard? Erman told him he could make $8 million per year someday. Scalabrine told him he could be the next Lamar Odom, if Odom took every possession as a personal affront. Scalabrine dug up old Lakers highlights for Green, an undersized, underathletic second-round pick who set out to become one of the best players in the NBA. "To that point," Scalabrine says, "that person did not exist." But the league was evolving as Green was emerging, and they became catalysts for each other. GREEN IS sitting in a booth at Twelve Bar Lounge, on the second floor of Oakland's downtown Marriott, when the news he has been waiting for scrolls across a TV screen. "Look at that!" he shrieks. "That is f------ beautiful!" Luke Walton, Kerr's prized lieutenant, has just been hired as coach of the Lakers. The announcement takes Green back to the spring of 2014, when he was coming off the bench for coach Mark Jackson, who wasn't convinced the Dancing Bear could guard power forwards. Jackson takes much flak for things he didn't do in Golden State, but with centers Ezeli and Andrew Bogut injured in the first round of the '14 playoffs, he put Green in the starting lineup for the last four games against the Clippers. "That changed everything for me," Green says. "It's when I realized I could do this." The Clips defended Curry as they typically do, blitzing him with two men when he comes off screens, only Curry kept hitting Green out of the trap. The Warriors lost in seven, but they found an outlet who could lead 4-on-3 opportunities, victimizing teams that overcommit to Curry. Three days after the series ended, Jackson was fired and Green's breakthrough was forgotten. "I was nervous as hell," he says, and meeting Kerr did not ease his anxiety. "I have to show him everything right now!" Green told himself in training camp, which included brainless step-back threes in transition. "I was terrible," Green admits. "It was a disaster." 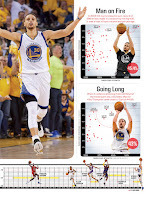 He'd set a drag screen for Curry, which was effective under Jackson, and Kerr would tell him to run to the first post. "I want you to play more like last year," Kerr said, and Green threw up his hands. "They're setting me up!" he vented to Walton, who became a confidante. "They're playing with my head." They were also toying with his bank account, Green feared, because he was entering a contract year. Money is a sensitive subject for Green, who used to live in a modest apartment in Emeryville, buying his groceries at Pak 'n Save. Growing up, Green hushed his mother when she told him they were poor, until he claimed her as a dependent on his taxes and had to ask for her income. "You were right," he told her. "We really were poor." He thanked her for making the money stretch. Toward the end of camp, Kerr met with Green. "You have to relax," the rookie coach told him. "If you relax it will happen." Green does not unwind easily. He is a terrible sleeper who can't nap for more than 20 minutes—"I feel like I'm missing something"—and can't caffeinate because he fears he will grow too hyper. He lacks the patience to cook with his girlfriend or sit at the park with their eight-year-old daughter. He chills out by watching basketball—specifically women's basketball. "In the NBA there's always a guy who is only around because he can jump," Green says. "He doesn't have a clue about the fundamentals. I learn more from the WNBA. They know how to dribble, how to pivot, how to use the shot fake." The system Green envisioned as a rookie, featuring dynamic tweeners who switch screens and create threes, was not so different from the one Kerr implemented. Green, with his versatility and zeal, made it hum, rather than incumbent power forward David Lee. He gathered the Warriors last June in Cleveland when they trailed the Cavaliers and cult hero Matthew Dellavedova 2--1 in the Finals. "Dellavedova is beating us to every loose ball!" Green roared. "The ball hits the floor and he's diving while we're standing and watching! This is the Finals! Do we even want to win? Tomorrow, I'll get 10 loose balls! Everybody else get one!" Golden State didn't lose again. Nobody toasted the title with more enthusiasm than Green—"I'm flying past every one of you on the street," he told Oakland police at the parade, while posing for pictures—but when the buzz wore off he went back and watched video of all the pick-and-rolls he ran with Curry. The way the Clippers defended Curry in 2014, trapping him 35 feet from the basket, had become standard procedure throughout the league. He came up with a mental checklist he ticks off whenever Curry hits him at the top of the key, triggering the 4-on-3 advantage. "I'm watching two [defenders]: the big man and the corner man," Green says. "If the big man comes up and the corner man doesn't come in, I throw the lob. If the big man stays up and the corner man stays home, I shoot the floater or attack the rim. And if the big man comes up and the corner man comes in, I kick it to the corner." There is inevitability to the Dubs' offense. "Somebody," Green coos, "has to be open." 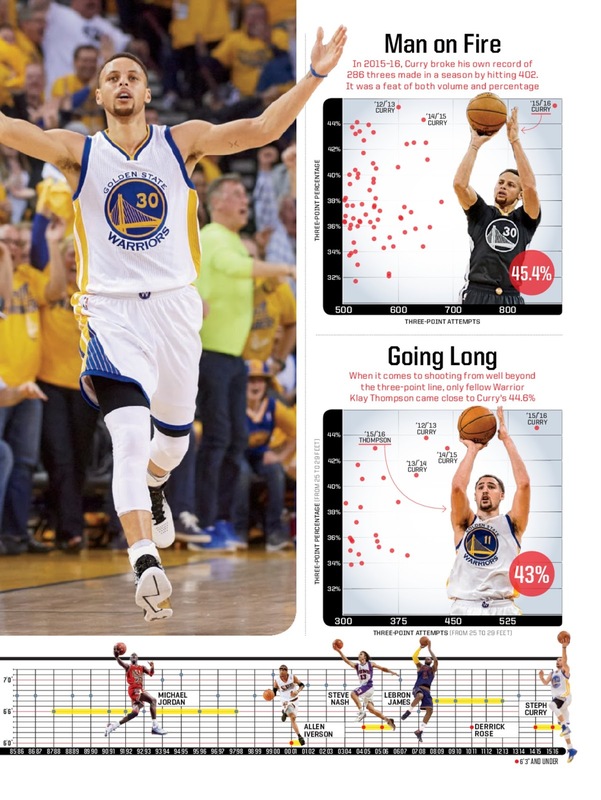 When Curry was not incinerating opponents this winter, Green was exploiting the fear that the MVP provokes. After signing a five-year, $82 million deal, Day Day delivered his finest season—14.0 points, 9.5 rebounds, 7.4 assists per game—but traditional stats don't do him justice. He compiled the best raw plus/minus of anyone in the past two decades, per NBA.com; Golden State outscored foes by a staggering 1,070 points when he was on the court. After Lakers forward Julius Randle singed Green in the preseason with his go-to stutter-step move, Green asked Warriors special assistant Nick U'Ren for every clip of the move, going back to Randle's days at Kentucky. "I studied the s--- out of that move," Green says, "and figured out what I needed to do to stop it." The Warriors won their first 24 games, and when Kerr asked in March if they preferred to rest for the playoffs or churn for the 1995--96 Bulls' record of 72 wins, Green spoke for the team. "I want to go for it," he crowed, and the others nodded along. He later sent a group text to make sure they agreed. Golden State was a basketball dreamscape, free of the drama and stress common in other NBA outposts. The Warriors were peaceful, joyful, functional, which for Green brings its own kind of misery. HE READS everything. 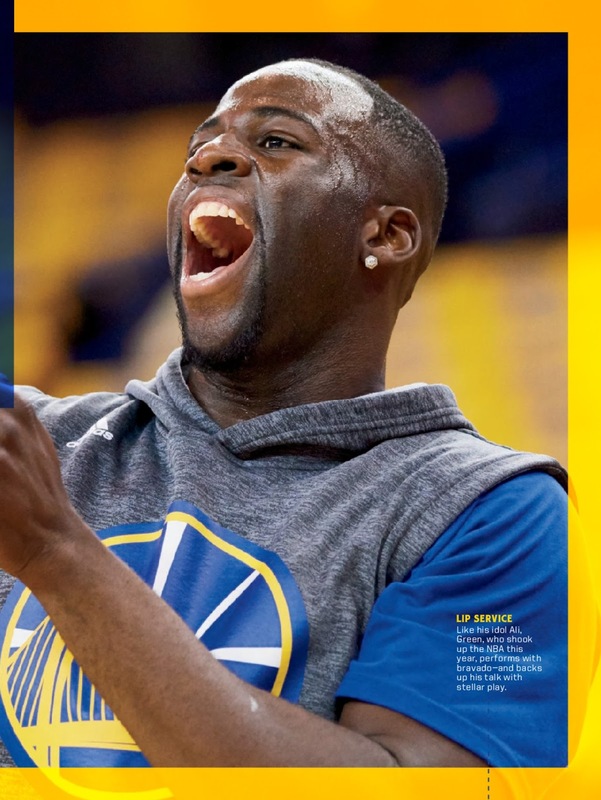 "I think it's cool to read that Draymond Green is transcending the NBA," he says. "I also think it's cool to read that Draymond Green is terrible." He sleeps with ESPN on his TV, volume raised, lest he miss a disparaging sound bite. A dig from Doc Rivers? A bold prediction from Jason Terry? A jab from a '96 Bull? If anyone tries to change the channel he pops up like a jack-in-the-box. "There are still doubters," he says. "I'll find them somewhere." As he speaks, an elderly tourist at the Marriott swings by his table and asks what team he plays for. "The Warriors," he replies. "Oh," the man repeats. "New Orleans." See, another member of the unenlightened. "Draymond is comfortable in conflict," Myers says. "He does not want to live in a copacetic world." Of course, strife is hard to find in the course of a 73-win season, compelling Green to manufacture a little. "Everything can't be sweet," he explains. "Everything can't be peaches and cream. There are times I feel like I just have to start yelling at people. I don't even know about what. It doesn't even matter. They get mad at me for a couple days, but I think it gives them back that life." Sometimes Kerr is the object of his ire, as occurred at Oklahoma City in February, when the coach singled out Green during a halftime film session. They had to be restrained from each other in the locker room. As the Warriors took the floor for the second half, trailing by 11, Walton begged Green to apologize, for fear Kerr would bench him. "I'll do that later," Green said. "This whole team is about to follow my passion, my anger." In the huddle, Kerr drew up a play on his grease board with only four names. "Where am I?" Green hollered. "Where is my name?" "Yeah, I'm playing!" responded Green, who logged a team-high 44 minutes. Golden State came back from a nine-point deficit with less than four minutes left to win in overtime. "We're not a crazy group, and you need a little crazy," Kerr says. "The Bulls needed Dennis Rodman. The Spurs needed Stephen Jackson. I have a potty mouth, so when Draymond and I go back and forth, there's some 'Hey, f--- you. No, f--- you.' The other guys are like, 'Oh, s---.' But that conflict—between Draymond and me, Draymond and the opponent, Draymond and the ref, Draymond and the world—gives us our edge." In the conference semifinals against the Trail Blazers, Green accidentally struck official Ken Mauer while complaining about a call, made a timeout gesture to Portland coach Terry Stotts during a Golden State run and essentially declared the series over after four games. He also stuffed box scores to the tune of 22.2 points, 11.2 rebounds, 7.4 assists and 3.2 blocks. Managing Green, Kerr acknowledges, was simpler last season. Now he is a leader and a top 10 player who is under scrutiny he never could have expected, whether he is completing another triple double or posting a Snapchat video of himself driving 118 miles per hour. "My fire is my gift and my curse," Green says. "I harness it 95% of the time, but the 5% I don't, it works against me." That's when he is most likely to get the text from Uncle Bennie: Get your hat, get your coat and hit that door. "We all go a little sideways sometimes, but Draymond has the ability to center himself," says Warriors defensive guru Ron Adams. "That's the mark of a grounded human being." Kerr backed off Green a bit after the OKC squabble, but a few weeks later, Green approached Kerr and requested that he coach him as hard as he did before. Kerr will never muzzle Green, but they talk a lot about the best way to utilize his baritone. "I think Draymond understands," Kerr says, "he can't be the guy who yells every day." As the Warriors lure more fans from San Francisco and Silicon Valley, Green is a bridge back to their base. He bowls at Plank in Jack London Square, hits up Too $hort shows, listens to E-40 and Mistah Fab. He isn't always the life of the party—"I'm actually very shy around people I don't know," he insists—but he'll open the door to his BMW at Yogofina and hold court while he eats his frozen yogurt. "Bro, you have got to be from East Oakland!" strangers tell him, almost daily. He understands why they say that. He plays with no fear and speaks with no filter. Green can be tough on teammates ("You know I'll outshoot you any day," he needles Mo Speights, who was minding his own business during a second-round practice) but he is way tougher on himself. "I sucked, I sucked, I sucked," he told Izzo after a first-round clunker. Yes, he still calls his college coach at 4 a.m., still suggests pick-and-roll coverages against Ohio State, still texts Spartans guard Denzel Valentine: "You're not grinding!" Green donated $3.1 million to Michigan State's athletic department last year, but that's just one of many contributions. 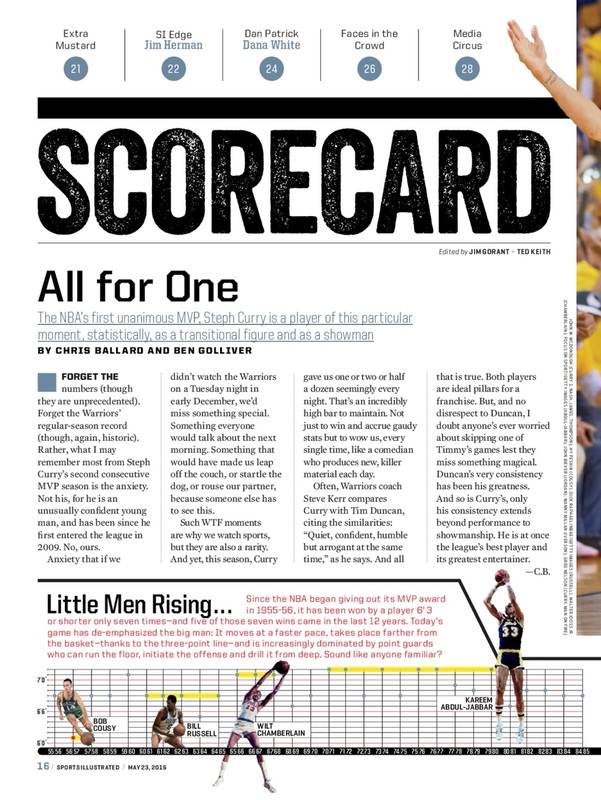 Valentine is a 6'5" NBA prospect, and four years ago somebody might have called him a tweener. Green has made that term obsolete. Now he is positionless. "Everyone is looking for the next Draymond Green," Scalabrine says. "Any undersized big who can shoot a halfway decent three should be giving him 10% of his contract." Green was recently reading a predraft roundup that included a blurb about a team searching for its Draymond Green. "How did this happen?" he asks himself. "It's like a script. It never happens this way." Teams can copy the Warriors' small lineups and switching defenses, but there is no cloning the harmony produced by Curry and Green. "It's the mellow lead singer," says Myers, "and the guitarist jumping into the crowd." They are much more than pick-and-roll partners. 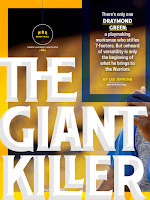 One night this season Green was asleep in his hotel room on the road when he woke up at 3 a.m. As usual, ESPN was on, but there were no juicy bites. Instead, the network was airing a profile of Curry, how he was scrawny and overlooked and his ankles kept buckling. The Curry biography is well known, but Green had missed some of the details. "By the end, I was in tears," he says. "I texted him: 'Bro, I'm so proud of you and I respect you so much.'" One was raised in the suburbs and the other in the city. One was too thin and the other too thick. One had money and the other didn't. But they were not the study in contrast Green once assumed. "Steph and I talk about this," Green says. "Yeah, we grew up under different circumstances, but I didn't get everything I wanted and he didn't get everything he wanted, either. We have more in common than you realize." This time of year, Green feels an invisible clamp on his lungs. It was tighter last spring, when he felt as if he couldn't take a deep breath for two months, but it's back nonetheless, a suffocating reminder of what's at stake: a title, a dynasty, a gilded season. Every player has their own way of removing the clamp. Curry will nibble his mouthpiece and shimmy his shoulders and fire. Green will clench his teeth and flex his muscles and fight, all Day Day, until the giants are gone.